Biggs here! 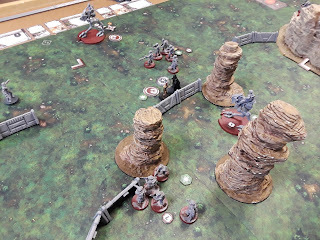 I finally had the chance to play an 800 point game of Legion. I've bought in with Rebels, and my friend Chris went with Imperials, and we both had assembled our core set and one of each expansion. 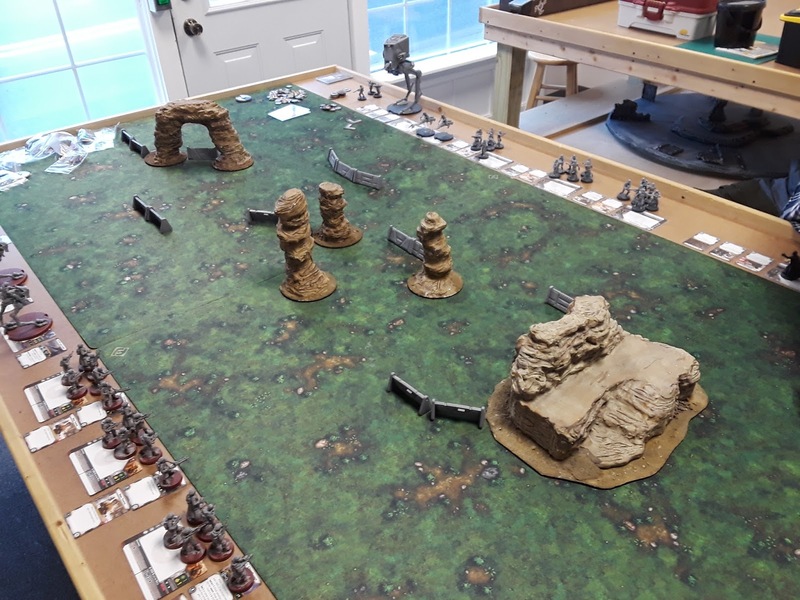 We were playing at our local game store, which had a lot of custom terrain available for us to play with. Here's the map we'd be fighting over. Aside from the standard baracades (we set them up from our own supply) there were also some rock formations. The "Arch" on my left side, the big rock of the three in the middle, and the highest face of the right hill were "height 2" and thus could make flying my Airspeeder more difficult. The hill itself was "height 1" so troopers could clamber down safely in 2 actions, or quickly in 1. 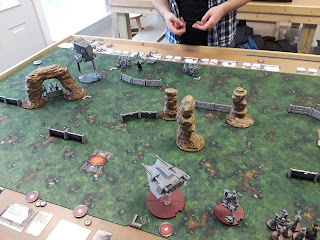 Chris chose Blue player, and cleared out Limited Visibility, not wanting to miss the chance to take mortar shots with his AT-ST on the initial rounds. I got rid of the "standard" long side deployment, in favor of Major Offensive, expecting it would hold up as "Disarray" was the final Red setup card. Chris cleared out the Blue card to give "Breakthrough" and I cleared out "Rapid Reinforcements" in favor of "Clear Conditions", giving us our battlefield. 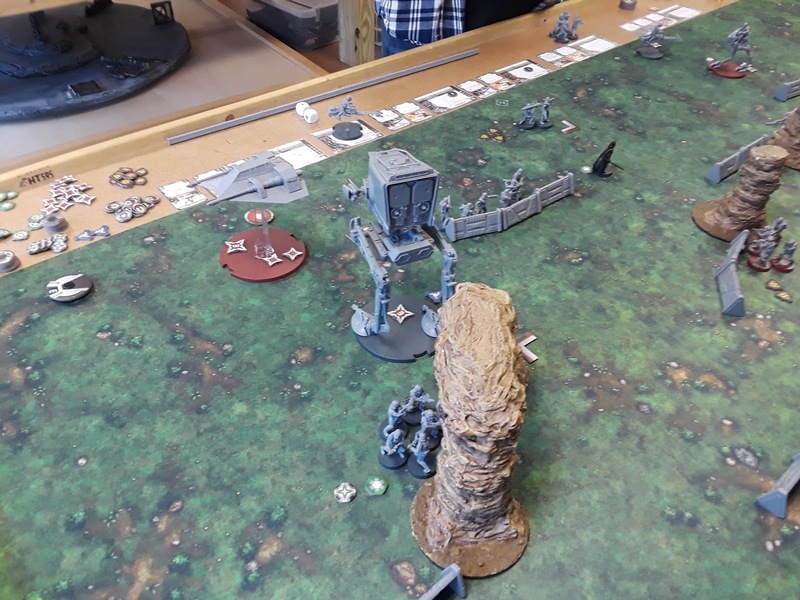 I set up my forces spread out on deployment zone, hugging cover or hiding outside of his AT-ST's line of sight, using the triple rocks in the middle of the board. My Airspeeder was set forward to pop out and begin harassing the enemy early. 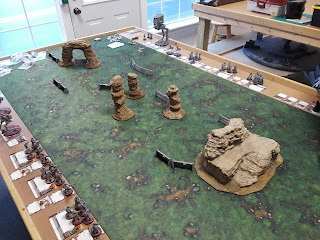 I had an AT-RT coming out from behind the hill, and was able to deploy a unit of my Z-6 Troopers on the hill itself. My Ion Troopers would be sneaking up through the rocks to hopefully help slow down the AT-ST, while the rest tried to take the middle of the map. Chris set up aggressively, putting his AT-ST with good sight at the middle of the map, as well as his HH-12 Rocket Troops up at the extreme edge of his deployment zone. Vader, a BTL Trooper squad, and his Speeder bikes hung out a little bit further back, while the final BLT Troopers set up shop in the arc. 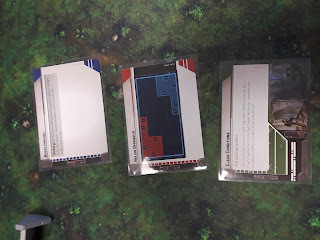 I did not get a picture of Round 1, but I played "Standing Orders" to his "Assault", and selected my Airspeeder as I wanted it to go last (the idea being to Last / First it and get as much damage / suppression as I could at the top of Round 2. His Speederbikes moved out towards the hill, while the Rocket Troopers held in place and shot at my Hill-side AT-RT which had just stumbled into their range. Round 2 began with an "Ambush" against his "Master of Evil", again with the Airspeeder. I got my Airspeeder into the middle of his deployment, suppressing his rocket troopers and getting some hits off on the AT-ST. He pivoted his AT-ST and lit up my Airspeeder with most of his guns. It would not be able to activate again (though it didn't die until Round 3), but this was enough for me to move up and take the middle of the board with my troopers. 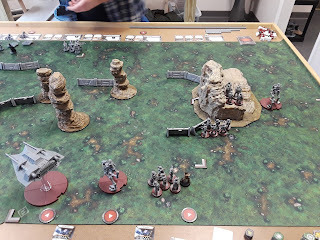 His Speeder Bikes were still harassing my flank by the hill though, so I was forced to focus fire on them with the AT-RT and Hilltop Z-6 Troopers. Vader activated last, after my Ion Troopers moved a bit to close, suppressing them for the start of Turn 3. With no support, the speeders couldn't hold up to the AT-RT and Trooper fire. Round 3 had "Son of Skywalker" give the magic refreshing dodge tokens to my troopers which had been spending the previous turns hustling into position, but Vader was ready with "New Ways to Motivate You" and he won the roll off for priority. I was able to move up the other Z-6 unit which split fire between his HH-6 Rocket Stormtroopers and the Speeder Bikes, further suppressing the former, and wiping out the later. Vader "motivated" the rocket troopers, which were down to just the squad leader and the rocket, so after shooting, the HH-6 Trooper died and the commander moved to slightly more safe position. Vader himself moved up to deal with the Z-6 Trooper squad hiding near the pillar, choking one and tossing his saber at another. Luke ran up knowing it was up to him to deal with Dad if he wanted his troops to make it to their objective. A "Laser Sword" fight in the middle of the field broke out. I figured Luke would be able to live through one round of Vader, so I went with "Assault" while Chris went for broke with "Implacable". Vader beat on Luke, then got a lucky draw and immediately beat on him again, but only got 4 damage across. 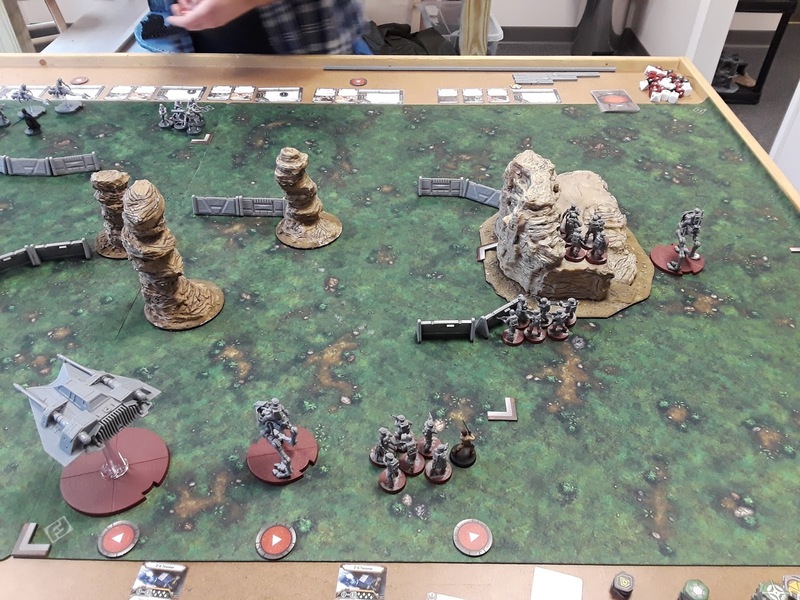 I had given orders to Luke and my two AT-RTs, so all that was in my pool were my troopers, so I was able to activate in the best order possible, getting my AT-RT from the hill, and the Z-6 Troopers moving towards the objective, and pinning down his BTL Troopers. Unfortunately they got lucky, clearing 2 of their 3 suppression tokens and damaging my AT-RT. 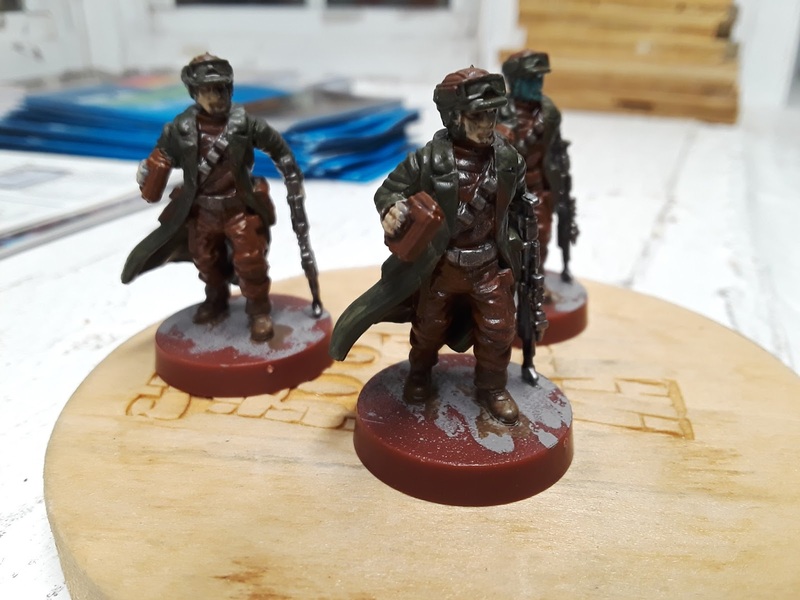 Meanwhile, I was moving my hilltop Z-6 Troopers, who I figured with a full sprint might be able to add to the objective as well. They clambered down the cliff, but I did it safe instead of hustling (2 actions vs 1). I probably should have hustled at this point, because it was going to be a photo finish. I knew at this point my only chance was to take out Vader (who had 3 damage on him, but no dodge tokens left). "Son of Skywalker" was my choice, while he went with "Push", giving orders to Vader and his AT-ST. I rolled hot with Luke though, taking Vader off the board! 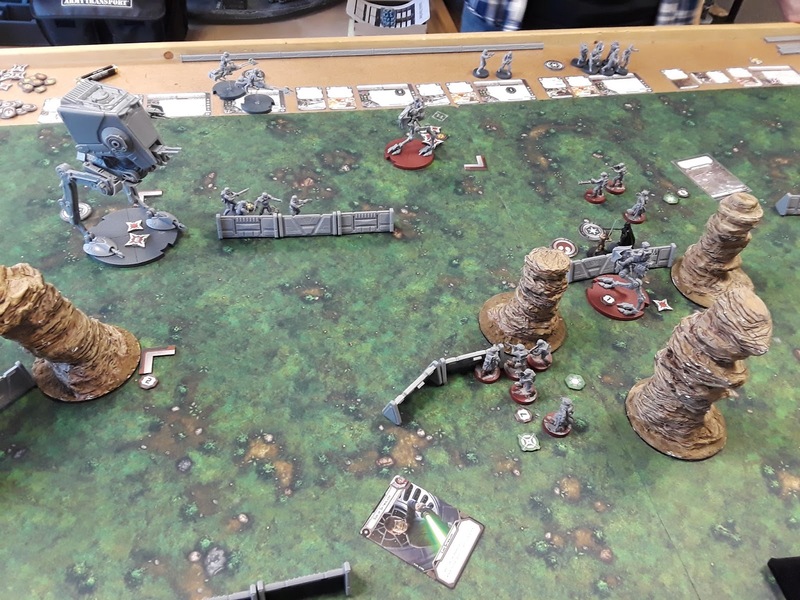 The AT-ST suppressed everyone it could, and without a Dark Lord of the Sith telling them not to, the BTL Troopers began to panic, running most of the way off the map. The AT-ST then decided to reenact Last Jedi, firing "every weapon" at Luke, popping him off. 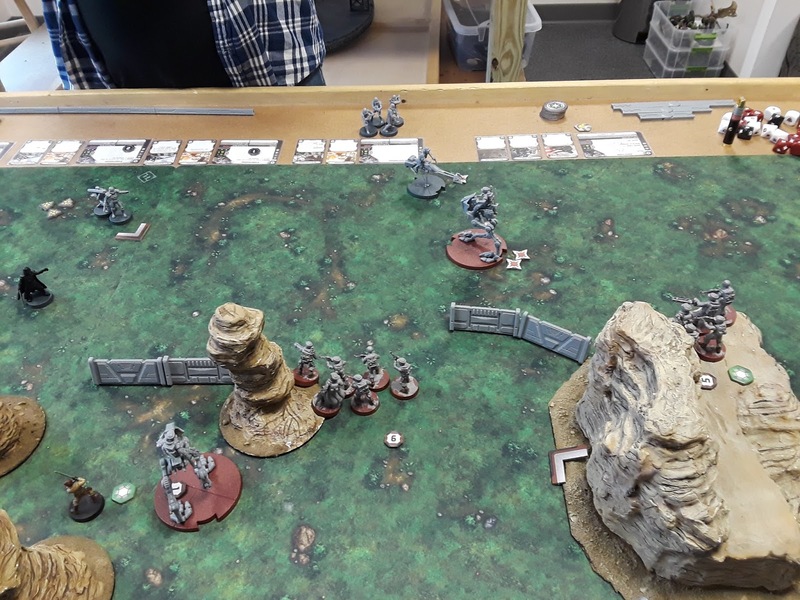 Not shown are the arch Stormtroopers making a run around the back to my deployment zone. 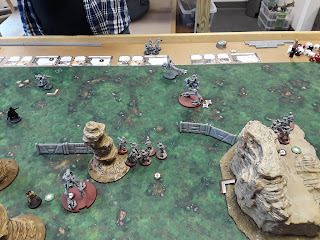 Too little too late for the game, because Luke had already made a "Push", which was enough to get 2 of my Troopers and the last surviving AT-RT into the deployment zone, for 3 Victory Points. 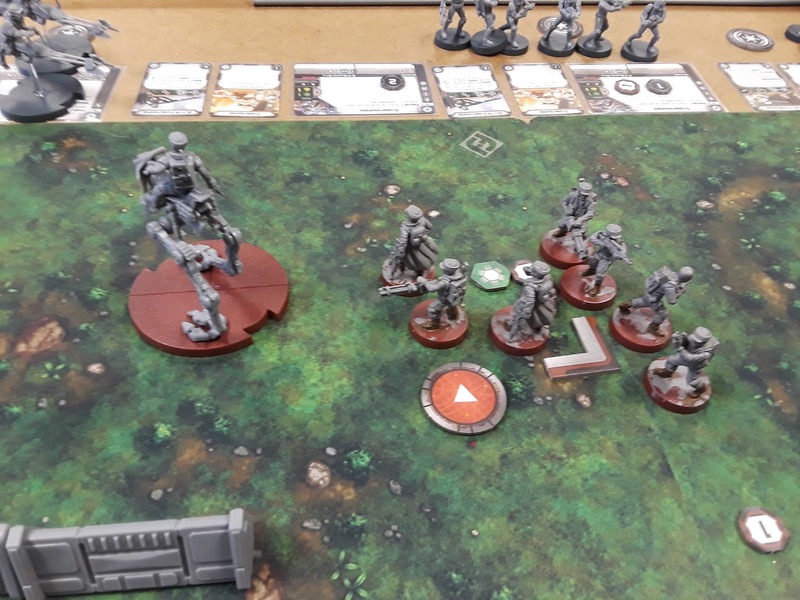 Chris's other BTL Stormtrooper squad had made it close, but a last minute move by my Ion Troopers got them into melee, stopping their charge. One nice thing I've seen about the game is by looking at the cards you used throughout the game, you can help refresh your memory of what you did at what point. - Suppression (and Ions) are KING. The difference between an enemy with an Aim token or one that moved into a good position and one that has to hold in place to shoot is immense. The AT-ST wasn't able to move after Turn 2 because I had an Ion trooper pointed at it, and that's pretty darn good - I took away a good 1/3 of its potential actions. - The game is sadly much, much more random than Armada. Because of defense dice, you can't count on... much. This in turn makes Suppression even more of a king of the battlefield, because it doesn't care that you didn't hit anything, it only cares that you could have. 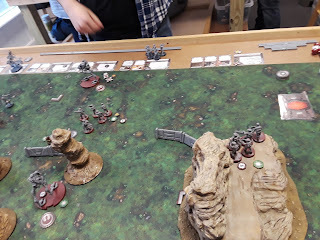 - On the other hand, having the Command Cards discarded meant that I had a nice record of everything I had done over the course of the game (more or less). At least, they hit the high points. 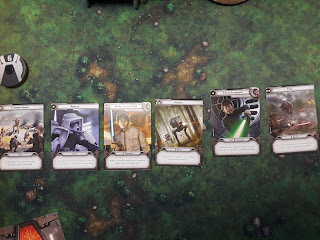 - On a related note: Standing Orders is a great Turn 1 card, at least until Leia and Veers show up with a chance to suppress something Turn 1. Being able to pick something and have that go last is really, really good, especially for a key unit like an Airspeeder. The AT-ST could have benefited from this as well, if it didn't want to go first to lob mortar fire. - Speeder Bikes are good, but can get themselves into trouble by getting away from your supporting troopers. Likewise, Airspeeders are good, but I accidentally wound up making my opponent spend way too many resources dealing with them. - I can't wait to get my next game in. Also I painted my squad leaders after the game. Tried to make one a Chiss, but wound up with more of a Yandu. Base coat and wash on them right now. Help! Help! I'm Being Suppressed! Impressions from my first Legions games.